Automate, track and report hospital‑specific clinical onboarding and orientation requirements. 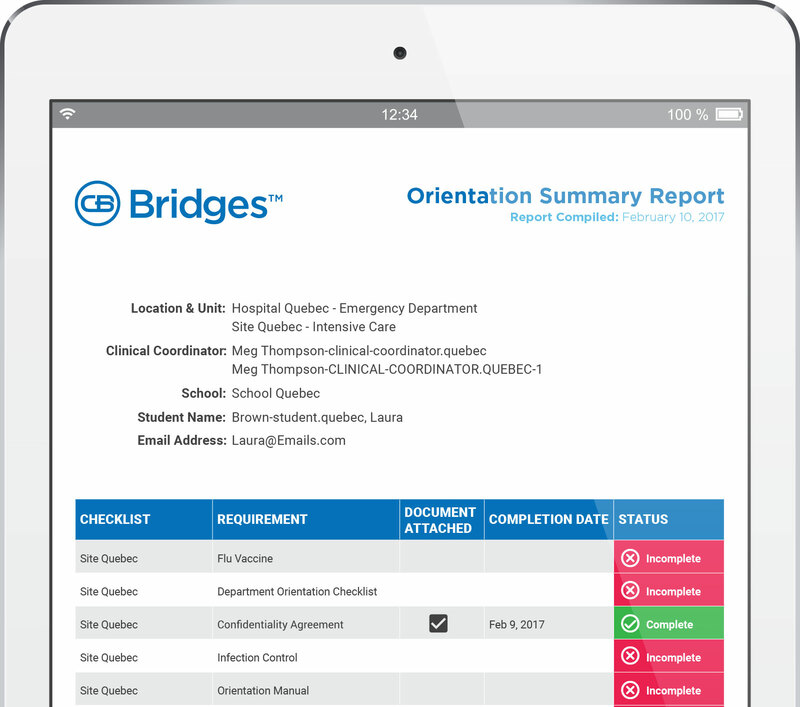 CB Bridges™ Pro Advantage Tracker makes managing your clinical onboarding and orientation process easier and more efficient than ever before. CB Pro Advantage Tracker seamlessly integrates and automates compliance tracking, clinical onboarding and orientation in one convenient location—with student documentation fully customized to each hospital’s exact requirements. Hospital administrators can also automate their part of the process, or they can continue with their existing process and tools. CB Pro Advantage Tracker gives you all the vital, time-saving tools you need. All in one place. Automates, tracks and reports hospital-specific documentation relative to clinical onboarding and orientation—delivered in the precise format your clinical sites require. Reduces administrative redundancy through our exclusive one-touch approach to automated requirement syncing, with zero reliance on third-party providers. Reduces risk through ability to quickly and securely complete signature-only checklist items online with verified e-signature. Requirements are tracked and managed in a single, intuitive role-based interface that enables you to view only what is important to you through features like filtered searching, customizable grouping, and hide-and-restore. Strengthens relationships between schools and health care facilities by allowing either party to pull fully customized attestation reports based on specific audit needs. Provides customized, automated system alerts that keep your students on track—no need to keep checking in on their progress. Built to benefit your students—giving them the ability to manage and upload all of their necessary documentation in one convenient location. Works independently—or in a shared platform—with clinical site partners. CB Bridges™ is backed by our best-in-class Customer Support and Onboarding Teams. We are 400+ experts dedicated to streamlining your clinical experience process. Take advantage of CB Pro Advantage Tracker today. To learn more, call 888.723.4263.